Ever wanted a book that tells you exactly how over 1,500 people like you build businesses earning $50,000 or much more from just a $100 investment? 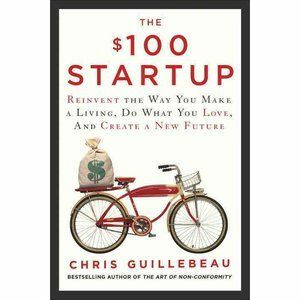 If so, Chris Guillebeau’s book MUST be on your reading list. It distills all the valuable lessons Christ gained from interviews and surveys with entrepreneurs over the past year. It tells you exactly how to take what you love and turn it into something people can’t live without. I don’t even know where to start! Chris gives you all the information and breaks down every step for you to go from a $100 investment to $100,00 profit! He goes very in-depth into how you need to find the crossroads of your passion and what people need. Once you have that, Chris goes on to share his individual advice on writing a one-page business place, creating an offer your fans can’t refuse, and launching like a pro. There are tons of checklists that really explain ever step of making your business plan or crafting an offer. Plus, every chapter ends with several questions for you to answer and expand upon before you continue. What makes Chris’s book unique? Besides Chris’s advice, this book is packed full of inspiring stories and case studies. Every chapter contains at least three stories of entrepreneurs who are living their dreams and running creative businesses. These stories really helped me see that anything was possible because if they could do it, so could I! Chris doesn’t end his book with a successful launch but instead goes on to address how you can tweak small things to increase your income, how to franchise, and how to know when your company is big enough. I found all of this incredibly helpful because it means I can keep coming back to this book again and again as my company grows. Honestly, I don’t know how to express how amazing this book is! Chris has poured his whole heart, soul, and brain into The $100 Startup. You will not only learn how to craft a business around your passion that brings in a stable (and perhaps completely unimaginable) income but you’ll be blown away by the success stories contained within the book. How can you not be inspired when so many people are living their dream?